ActionBlu AVCHD is a powerful, efficient and simple to use tool for authoring HD camcorder content for playback on AVCHD compatible Blu-ray players using standard DVD-R recordable media. Enjoy your cherished moments in their intended stunning clarity. Stop downgrading your HD clips to standard definition or waiting overnight for other HD editing solutions to finally finish their re-encoding. Works on most popular HD camcorders from Aiptek, Canon, Flip Video, Kodak, Sony Bloggie and numerous others, including the new Apple iPhone 4. Works with just about any HD camcorder or camera recording in h.264 video in either Quicktime (.MOV) or MPEG4 Part 10 (.MP4) file formats of 720p and greater, including 1080p. With ActionBlu you can arrange, join and set chapter times for rapid seeking during playback, all in a matter of minutes not hours. Maintains audio-video syncronization on all clip joins. Slay that HD encoding Time Vampire once and for all and join countless others who have chosen ActionBlu as their HD camcorder authoring tool of choice. 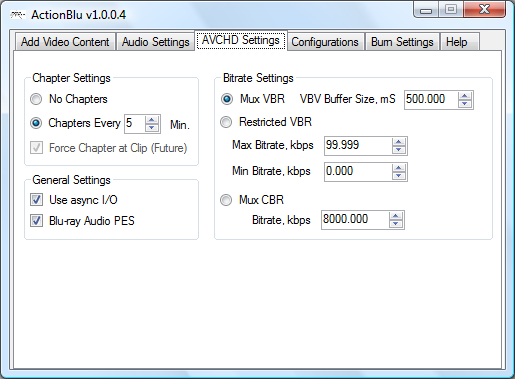 Added ImgBurn support for DVD burning engine. Added various hot links for improved customer support. Improved error handling for corrupt or wrong input files.